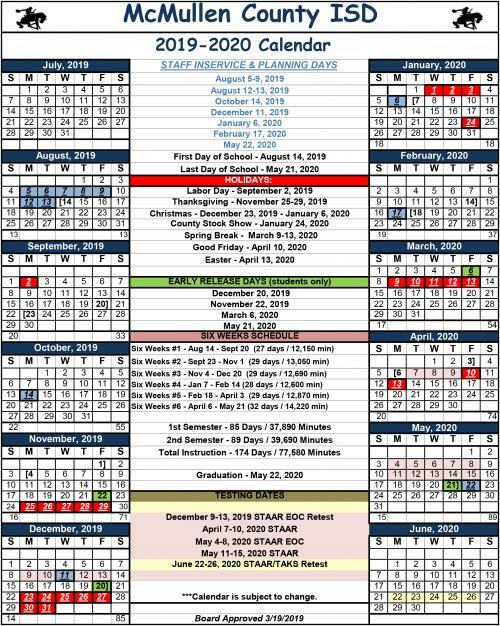 Click here for a downloadable 2019-2020 School Calendar. The mission of McMullen County Independent School District is to assure that all students develop their maximum capabilities in academic skills and acquire a knowledge base to enable them to become productive members of society. To accomplish this mission, the school environment will be characterized by strong instructional leadership, high expectations for all students to succeed, ample time devoted to teaching and learning, a school environment that is safe and orderly, as well as independent and free from alcohol and other drugs, frequent monitoring of student progress and effective home-school communications. Educating the children of McMullen County I.S.D. to be productive in a changing future requires a commitment from the entire school system: teachers, administrators, trustees, parents and students. This excellent, educational system shall be characterized by quality, equity and accountability toward accomplishing the district’s mission and goals.